Pericytes are perivascular cells associated with capillaries. We previously demonstrated that pericytes, identified by desmin immunohistochemistry, produce type I and III collagens in the anterior pituitary gland of adult rats. In addition, we recently used desmin immunoelectron microscopy to characterize a novel type of perivascular cell, dubbed a desmin-immunopositive perivascular cell, in the anterior pituitary. These two types of perivascular cells differ in fine structure. The present study attempted to characterize the morphological features of pituitary pericytes and novel desmin-immunopositive perivascular cells during postnatal development, in particular their role in collagen synthesis. Desmin immunostaining revealed numerous perivascular cells at postnatal day 5 (P5) and P10. Transmission electron microscopy showed differences in the fine structure of the two cell types, starting at P5. Pericytes had well-developed rough endoplasmic reticulum and Golgi apparatus at P5 and P10. The novel desmin-immunopositive perivascular cells exhibited dilated cisternae of rough endoplasmic reticulum at P5–P30. In addition, during early postnatal development in the gland, a number of type I and III collagen-expressing cells were observed, as were high expression levels of these collagen mRNAs. We conclude that pituitary pericytes and novel desmin-immunopositive perivascular cells contain well-developed cell organelles and that they actively synthesize collagens during the early postnatal period. The online version of this article (doi: 10.1007/s12565-013-0180-3) contains supplementary material, which is available to authorized users. We are grateful Megumi Yatabe for her suggestions on transmission electron microscopic procedure. We also thank David Kipler of Supernatant Communications for revising the language of the manuscript. 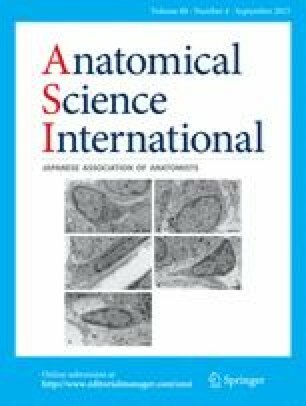 This work was supported in part by the Research Award to JMU Graduate student, promotional funds for the Keirin Race of the Japan Keirin Association, and a Grant-in-Aid for Scientific Research from the Ministry of Education, Culture, Sports, Science and Technology of Japan to T.Y. (22590192).